In my previous posting, I did emphasize that the Bitcoin ledger (i.e. the Blockchain) is quite robust because of the strong encryption of all transactions despite everybody can access, download and play with it. (Please also read my warning in my other posting here). The encryption technology is creditable because it was developed by the NSA of the US Government in 2001 and had been tested and used for many years. In brief, each transaction (in fact, I would rather call it an assignment because the recipient plays no role in the execution of the transaction) is encrypted (or hashed) by SHA-256 (a cryptographic hash functions developed by NSA of the US Government). The following fictitious transactions may provide you some idea about the encryption. Applying the SHA-256 function to the two transactions produces the following fixed length outputs. The technical term for the output is a digest. You can try out the SHA-256 function here to encrypt your secret message to grasp an understanding what it is and may be you can use it to verify the above two transactions. It is not difficult to regulate Bitcoin by treating it as a commodity and applying the rules for commodity trading on the exchanges. The exchanges should also be registered and regulated as a commodity exchange. First of all a definition must be given to cyber commodity (Bitcoin or Litecoin). Such definition should read like: A Cyber Commodity (such as Bitcoin) is defined as something with perceived value passing between two parties in a transaction in cyber space or otherwise with total daily trading value in all known trading platforms of not less than one million USD in any business day and the number of transactions being not less than 10,000. A committee under the commodity trading regulatory body should interpret the aforesaid guidelines and determine when a cyber entity should be classified as a commodity for regulation in an exchange. There will be similar product (like Bitcoin) coming up in future. Before the participants have grown to a significant size and before total monetary value involved is of any significance, there is no need for any regulation because many newly born cyber entities may not live long. Regulating too early is just a waste of money. For commodity traded outside the exchange between two consented parties, regulation is not necessary. This similar rule should apply to cyber commodity (Bitcoin). If you want to invest in Bitcoin, there are some fundamentals about this commodity that you must know. Without a firm belief of the followings, it would be better for you to avoid this commodity. First of all, you must treat Bitcoin as a commodity. It is not a currency because there is no promise there. There is no support to it other than supply and demand. What value is given to it depends on how you see it such as you value an ounce of gold or one carat of diamond or a piece of jade. Bitcoin is not tangible but a cyber concept of trust. Over a time span of 100 years from now, the systems will create to a maximum of 21 million Bitcoins which are being discovered very slowly by a group of people called miners who are also volunteer validators of transactions. The miners only follow system discipline to validate transactions and they will be rewarded with Bitcoin if they do them right. But they have no obligations to ensure the transactions are correct. Secondly, in any deal (that is transaction) , there is only two parties involved namely a sender of Bitcoin and a recipient of Bitcoin. There is no third party witnessing what is happening, although all communications are encrypted by the system. In other words, if the sender and recipient are involved in a dispute about a transaction, there is no way of showing evidence to prove who is right and who is wrong. It is just like a sender passing cash (such as a stack of bank notes) to a recipient who issues no receipt. Thirdly, you must have good faith in the Bitcoin transaction which happens as follows. There is a general ledger system called the Blockchain which records all transactions in encrypted form. This is the only book keeping system which sequentially records all transactions from genesis to the present. 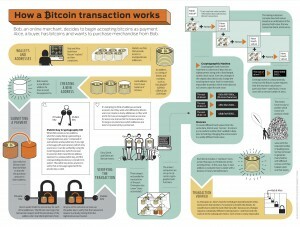 It is supposed to be very robust such that nobody can break into it to alter the already committed transactions. Any transaction will be committed to the Blockchain after 6 miners have validated it and not before that. On one hand, we can say that nobody owns this Blockchain because there are many copies of Blcokchain scattered and stored in different computers called nodes in different parts of the world. On the other hand, we can also say that everybody owns it because anybody can download the Blockchain. As long as Bitcoin exists, the size of the Blockchain will grow forever. You must trust that there is no mutation in this growth. Finally, there are already copycat systems out in market such as Litcoin. People will gradually learn more about this relatively new cyber product. So, the mystery will soon be over.